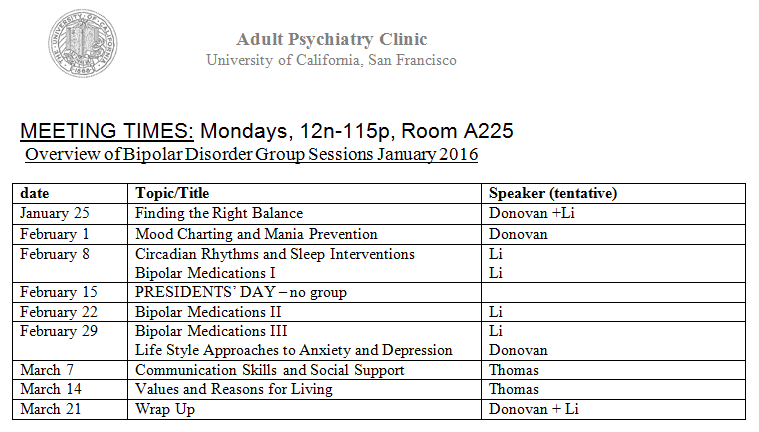 The Adult Psychiatry Clinic at UCSF has released the schedules of their Group Psycho-Education for Bipolar Disorder for January 2016. This activity under the Bipolar Disorder Program of the Department of Psychiatry is aimed at providing a community resource for individuals with bipolar disorder, mental health professionals and psychiatrists. Headed by Dr. Descartes Li, the program director, it is designed to augment the treatment of bipolar disorder and to help fill the needs due to the increased number of referrals from the community. The first meeting starts on January 25th 2015. It runs for eight sessions, Mondays, from 12:00 pm to 1:15 pm at the UCSF Parnassus Campus. Please take note that there is a fee for these sessions however insurance may cover most or all of the expenses involved. For more information, you may contact Dr. Li at 415 476-7448. Please refer to the calendar of activities below for more details.